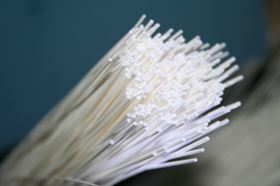 Hollow membrane fibres made in a NUS laboratory. membrane systems operation, integration and optimisation. Recent NUS membrane research projects have included a new desalination process that mimics the way that Mangrove trees thrive in seawater. The trees demonstrate salt exclusion at their roots, where a waxy substance called suberin forms at specific cell layers, preventing 95% of salt entering the plant root. The project aims to understand the transport of salt across a cell membrane. Researchers will examine the transport properties of selected proteins and attempt to incorporate these proteins into a biomimetic membrane - a membrane that incorporates biological elements. The consortium will promote research, collaboration and commercialisation in membrane products and technologies.